Hi and welcome to our blog today. It's Teresa here and I have a really special card i did for my niece to send her because she is a little down about going back to school to get her degree. It's a hard thing and a huge leap of faith to quit your job and go back but she was born to greatness so this will be perfect to give her inspiration to reach her goals. 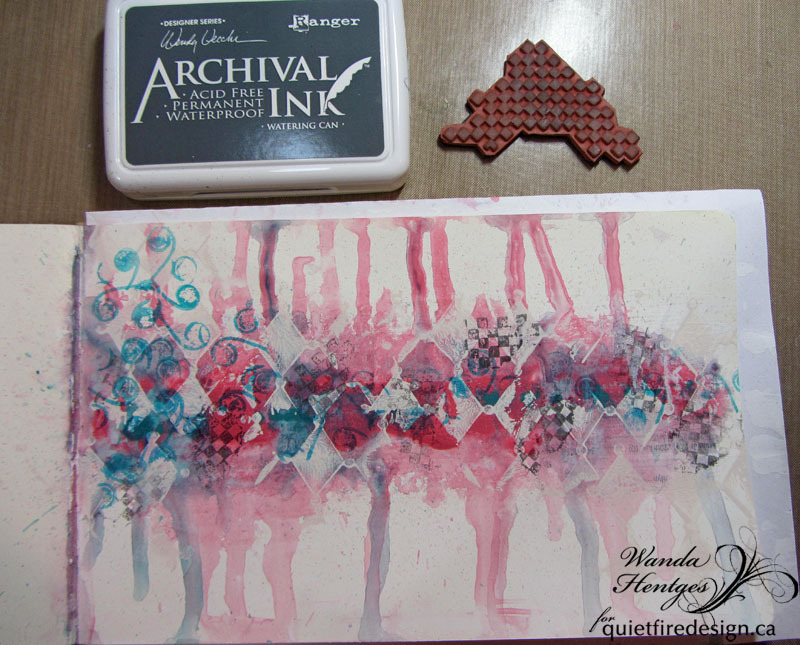 To make my card I used one of our new clear stamp sets and some special vintage papers that i just got. The stamp set is called the "Soar Collection" and there are lots of beautiful stamps in the set. I think you will really love to create with them. 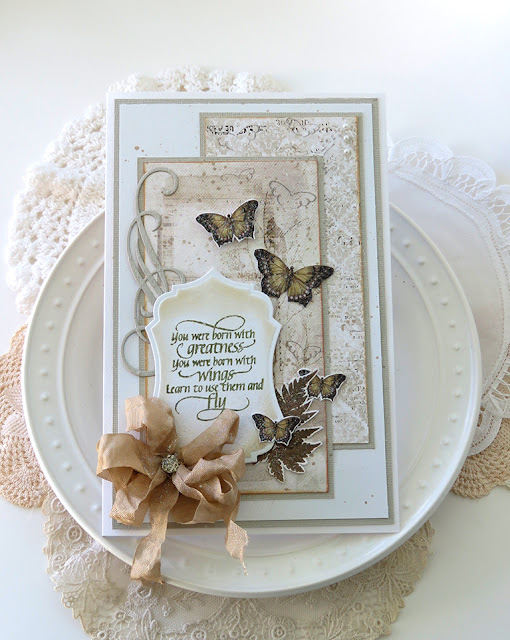 You all know that i love making vintage inspired things so using all these pretty muted colors with the butterflies fussy cut on it was really fun. Sometimes things just work and the stamp says it all. I added some extra flicks of Tim Holtz ink on it and also a touch of glitter spray. Soooo fun! 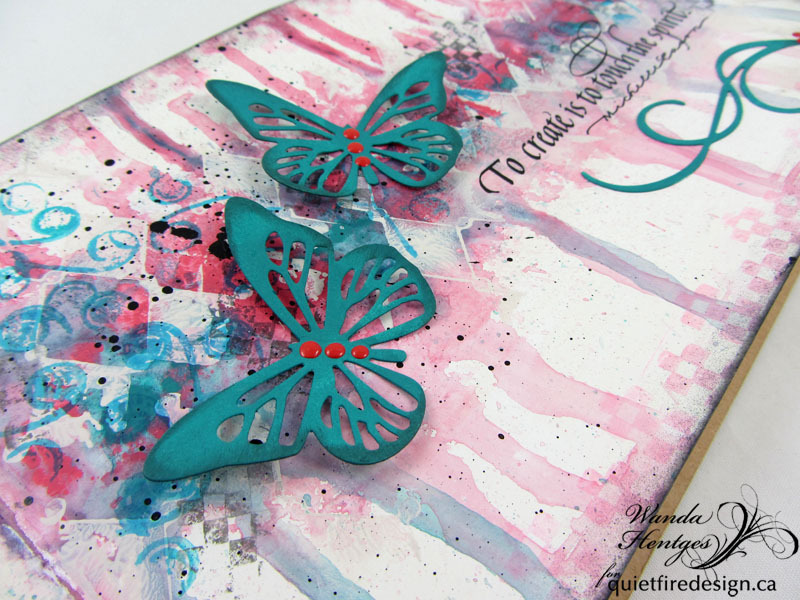 Thanks so much for stopping by and hope you get a chance to hop over and see the new clear stamps. Next time i will make a few things with the birthday set to share!! Yogi here today and Suzanne asked us to use older stamps... No problem... I have ust about all of Suzanne's stamps and love them all... BIG GRIN and I thought I'd combine it with one of Suzanne's stencils.. Scored and folded my dark blue toned cardstock to create the easel. Cut another piece, same size as card and adhered to front. Lay the stencil under a thin piece of cardstock and with the side of a dark blue colored pencil, colored the whole piece. Burnished with a piece of tissue paper, staying clear of the star spray. 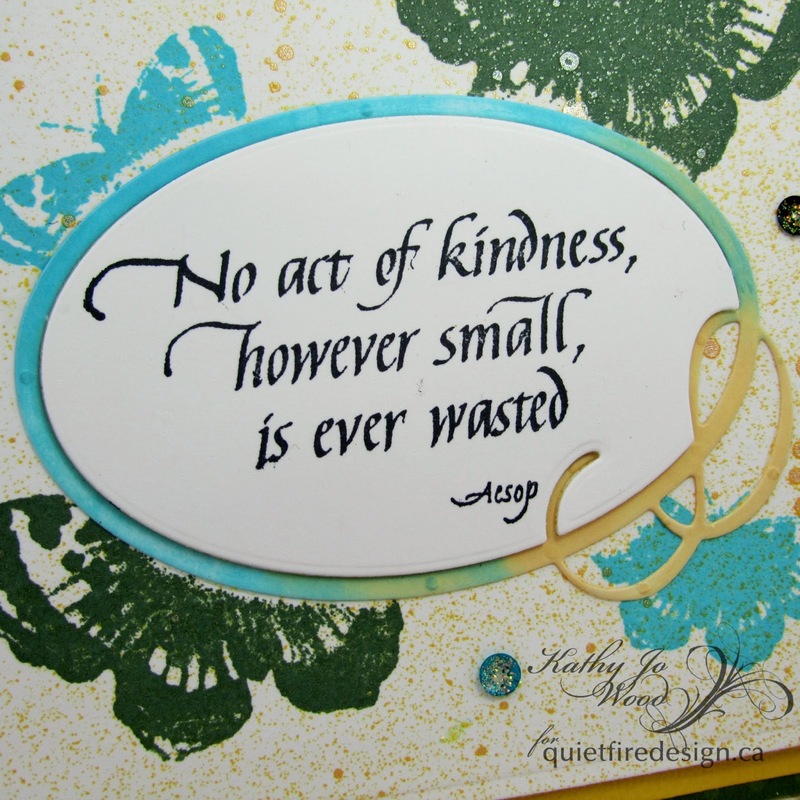 Stamped the quote using Versafine Black Onyx and clear embossed. With my finger applied a very light coating of Dorland's wax medium (same as Micro Glaze) over my whole background. Burnished that as well, again staying clear of the stars. Die cut the star frame border (Elizabeth Craft Designs), moving the die to create the size I needed. Adhered to star base and trimmed off the excess. 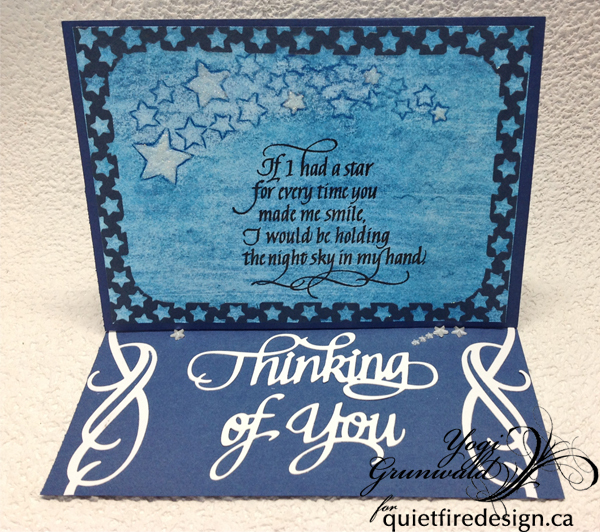 On the floor: Die cut the "Thinking Of You" from a glossy white thick cardstock. Adhered to floor. I had the flourished frame already cut in my stash, so trimmed it down to those two side elements. Adhered to floor. Adhered some white star rhinestones to act as my stopper. Hello! 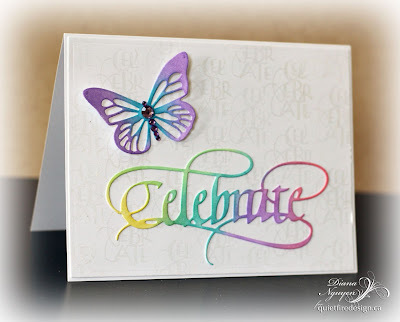 Diana here with a card that can be used for any celebratory occasion but feels like spring to me! It's in the 70s today and it's FEBRUARY! I like it. It's hard to see in some of the photos because the background is so subtle but that was what I wanted so that the beautiful Celebrate die cut would really pop. 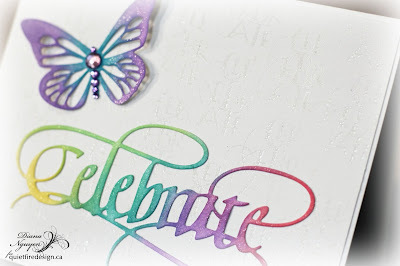 I used the "Celebrate" clear stamp from the Happy Birthday collection to make my background. 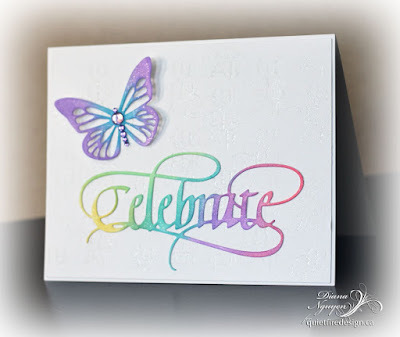 I stamped it repeatedly on a white card stock and clear embossed. Though the picture looks almost ivory there, it was the best picture that captured the clear embossing even though everything was done with Neenah white card stock. The Celebrate and butterfly die cut were sponged with Distress oxide inks and then adhered to the front of the card. I added a bit of adhesive rhinestone to my butterfly and voila, all done! 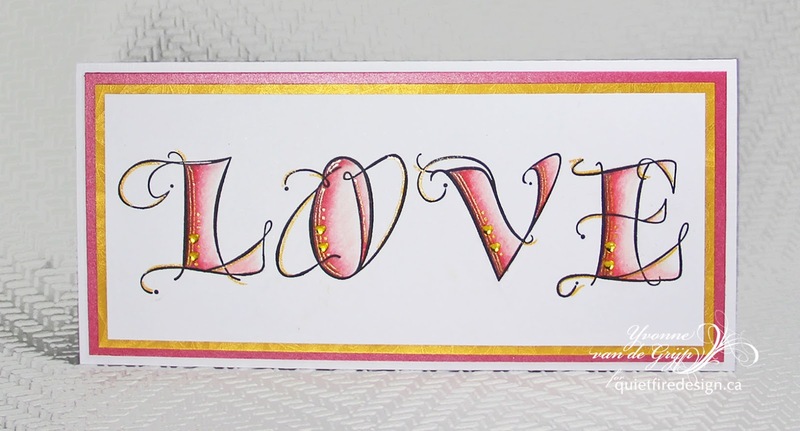 For a little big of extra sparkle, I went over all the die cuts with a clear glitter Wink of Stella pen. It's so pretty and delicate in real life! 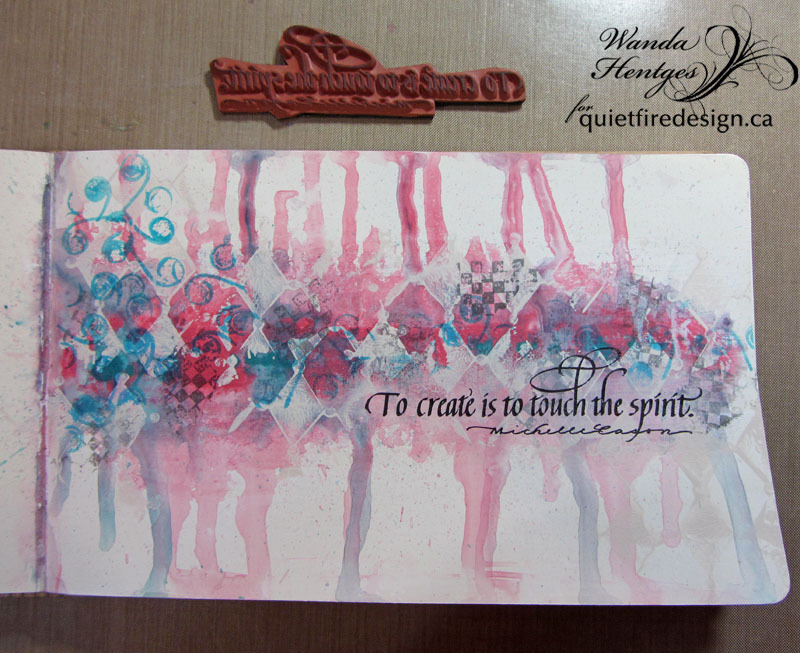 I hope you like it and it inspires to you to look through your stamps to see what would make a great background! I chose to work with a pink palette, using a subtle difference between the frame and the background in order to emphasize Blessings. The butterfly is telling us that big changes are coming as the spring arrives and the earth wakens from its winter sleep. 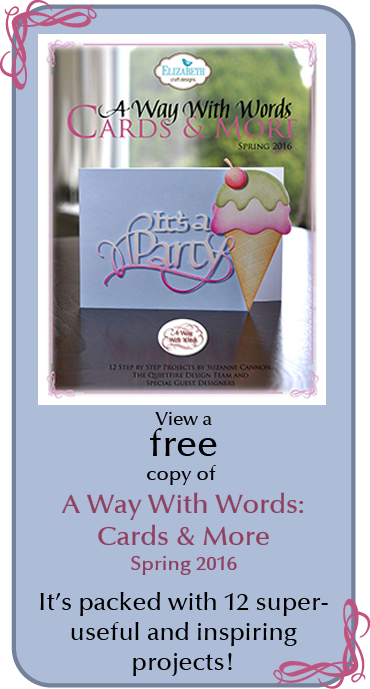 Form a 7x6" tent fold card base from dark pink card stock. 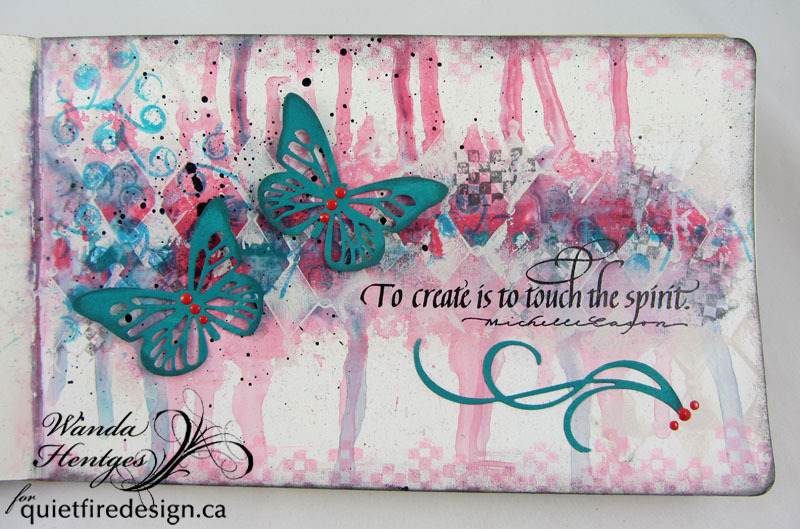 Cut a medium pink panel measuring 6 x 4 3/4" and mat with a pale blue card stock measuring about 1/8" larger on all sides. Cut another mat from white measuring about 1/8" larger than the pale blue card stock on all sides. Adhere all the panels together. 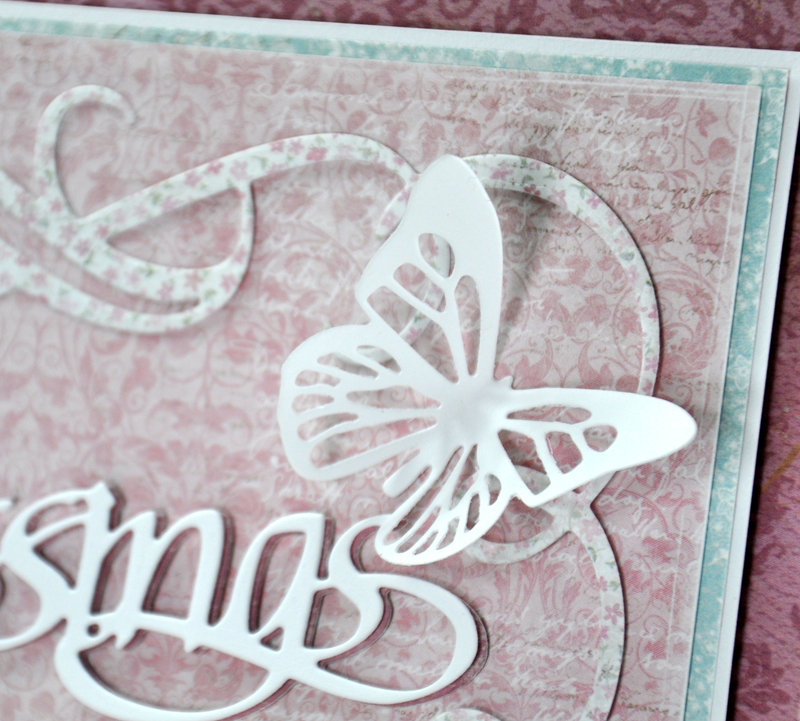 Die Cut the Flourished Frame from a pale pink card stock. Die cut one Blessings and the butterfly from white card stock. 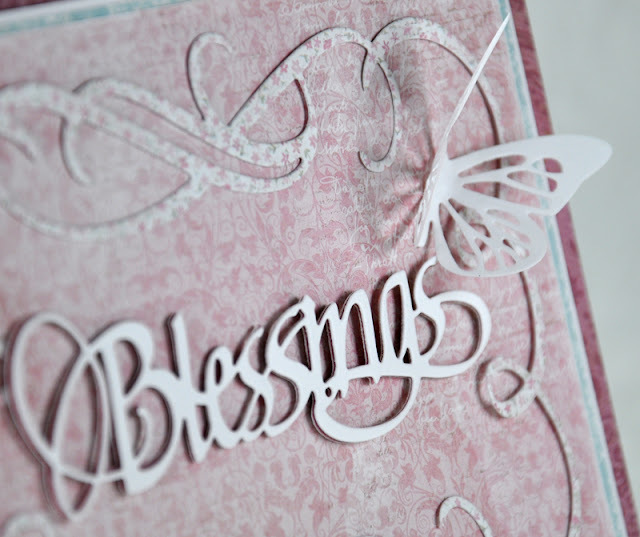 Die cut another Blessings from dark pink card stock. Adhere the two Blessings together with the darker one behind and slightly offset to form a drop shadow. Adhere all elements to the panels as shown and attach this to the card front with foam adhesive. It's an easy card! 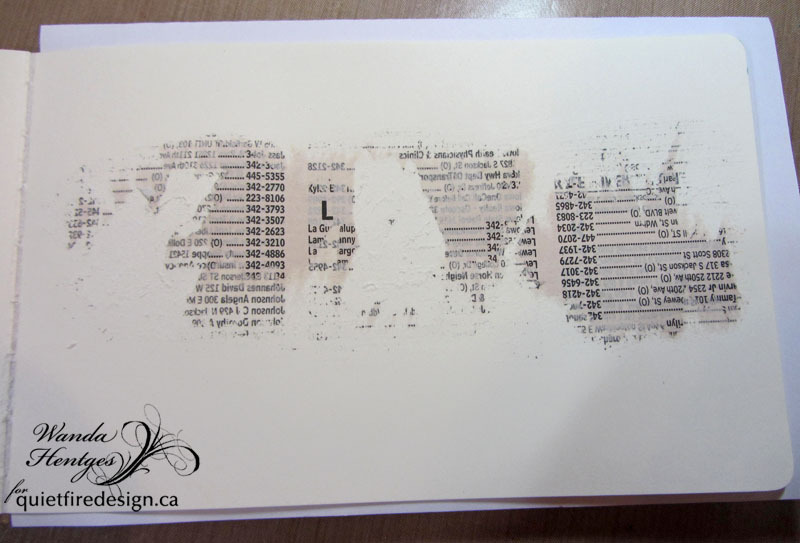 You can make it your own, by changing the colour of the card stock, or hand colouring each element. Have fun! Thanks for visiting! 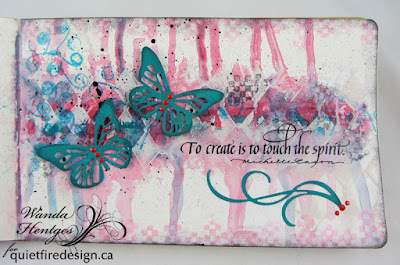 Don't forget to enter the giveaway at Elizabeth Craft Designs Challenge Blog Post! Hi!! 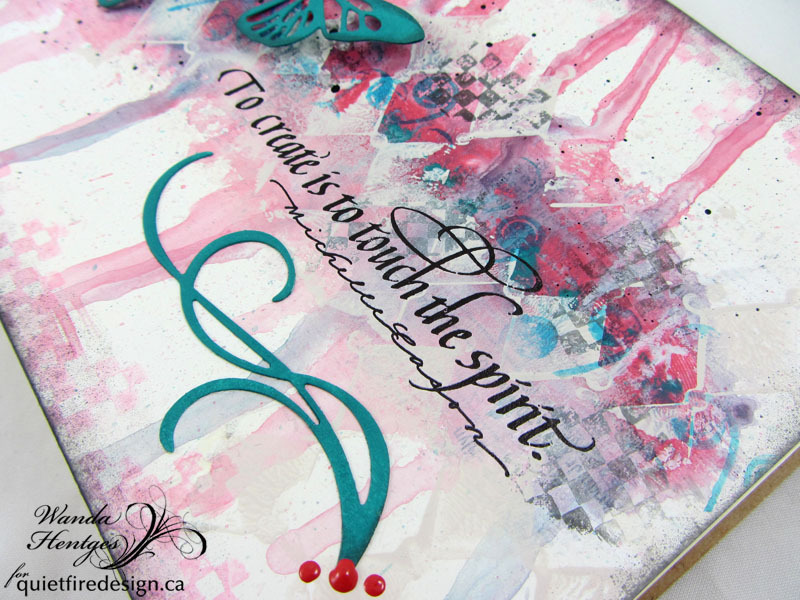 It's Wanda here today with a tutorial for a fun art journal page with several layers. The page looked a bit ugly after some steps but I think it came together really well at the end. I'm working in a small Dylusions Creative Flip Journal. I tore a page from a small old phone book. Across the center of a page in the journal I brushed Distress Collage Medium Matte just long enough for the phone book page width, pressed the phone book page on the medium, let it dry a couple of minutes and pulled the phone page back off. Some areas came off completely. Some areas left the text from the back side of the page and other, more dry areas, the whole page stayed stuck. I repeated the process to finish going all the way across the center of journal page. A thin coat of Gesso (Golden brand) was brush over the entire page. 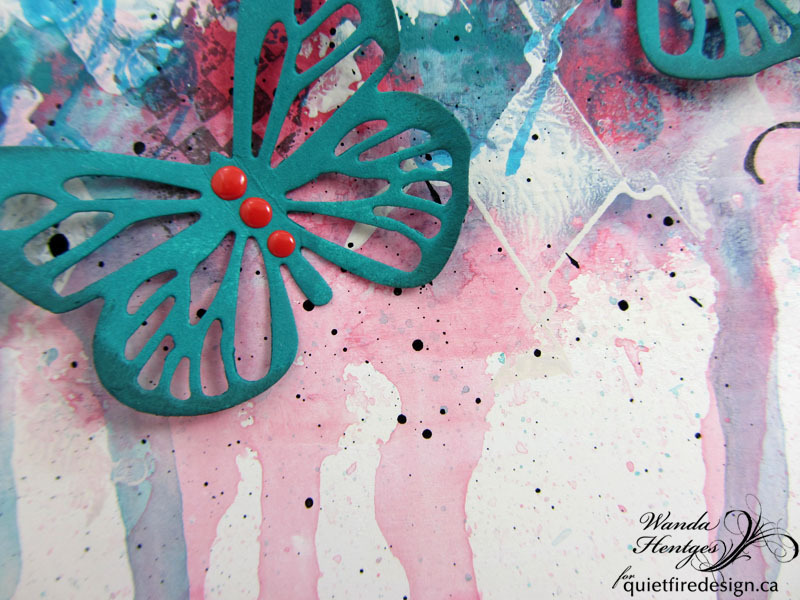 Drops of Fresco Finish Acrylic Paint (PaperArtsy), color Prawn, was put across the center of the page. I spread the color with my finger, sprayed the paint with water and allowed it to drip down blotting the drips at the bottom of the page. 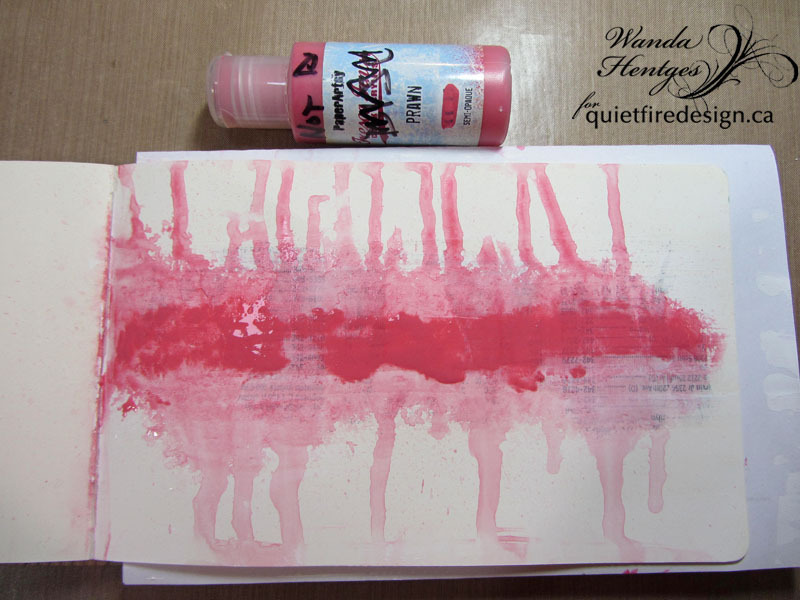 The book was turned around, the paint sprayed with water again and allowed to drip the opposite direction. It was then partially dried with a heat tool. Next came Jade Fresco Finish Paint but not as much paint as the Prawn. The spraying and allowing to drip process was repeated and the page dried completely. 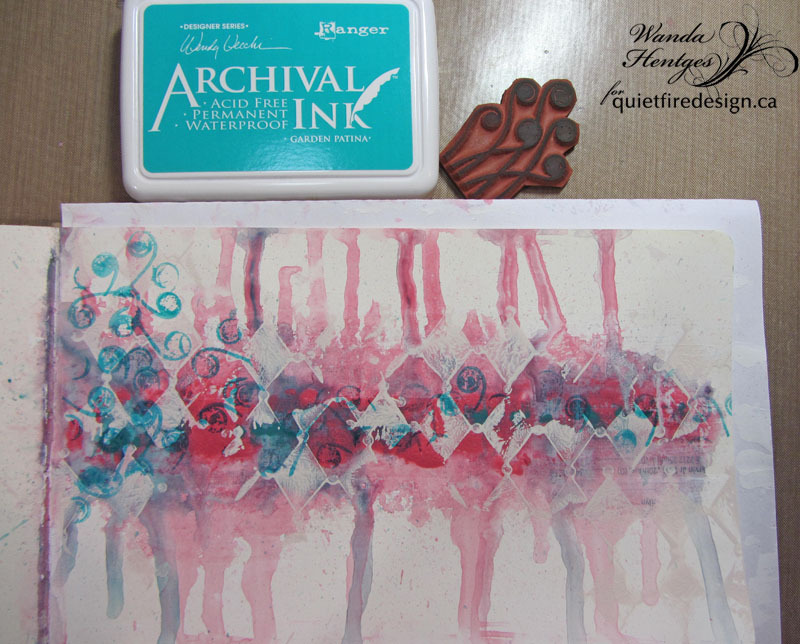 The Dotted Harlequin Background Stamp was used to stamp Nougat Fresco Finish Paint across the page. I did not use a block so I could bend the stamp and just use portions of it. 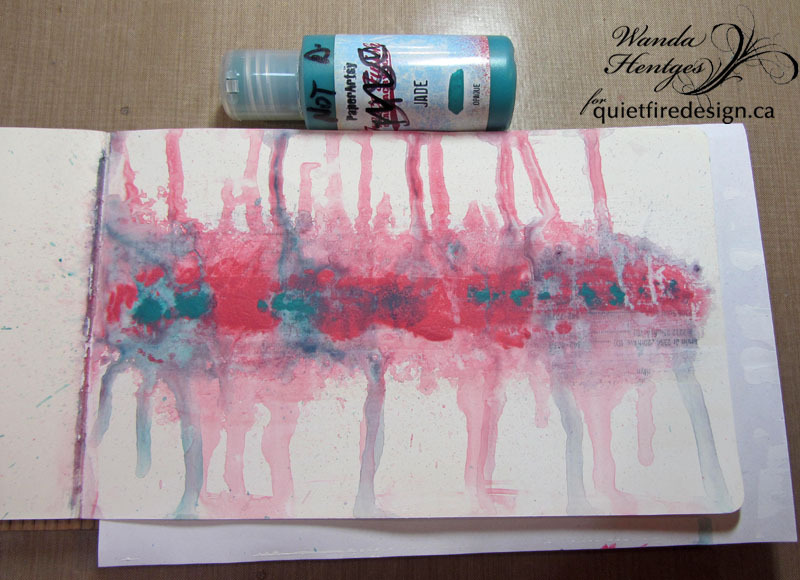 The paint was put on the craft sheet and spread thin with my finger. 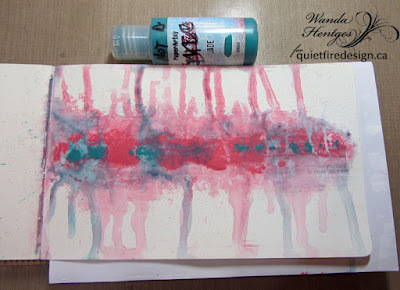 You press the stamp into the paint and then onto the page. 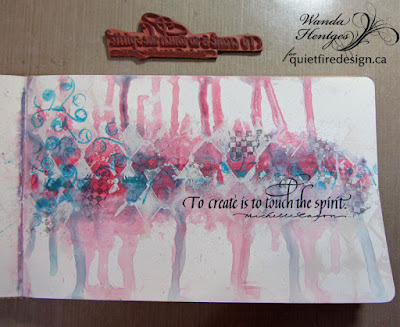 The Fiddleheads were stamped using Archival Ink Garden Patina (Ranger, Wendy Vecchi). 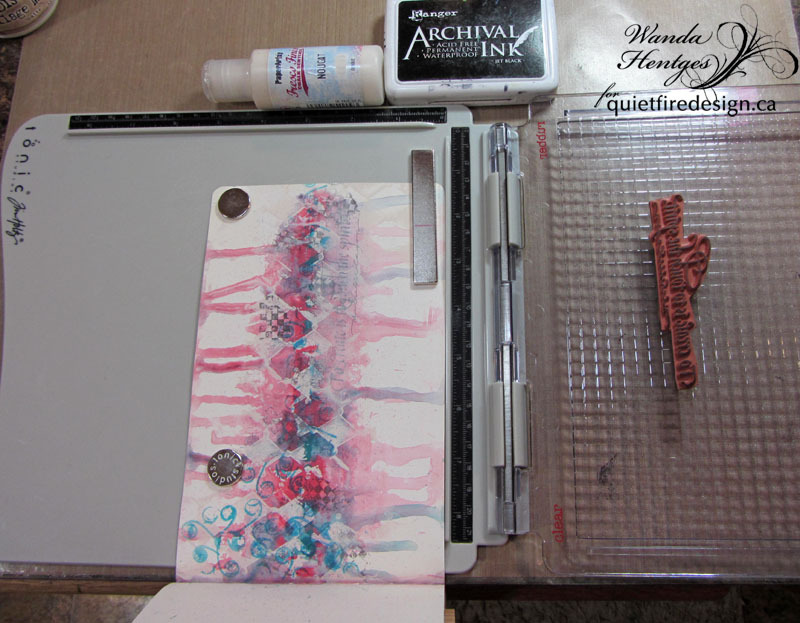 Again, I did not use an acrylic block for stamping so I could bend the stamp and just use the top part of the image randomly across the page. 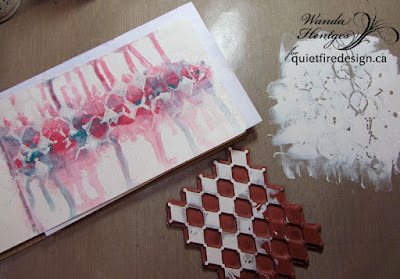 The Checkerboard Corner was stamped in the same way using Archival Ink Watering Can (Ranger, Wendy Vecchi). 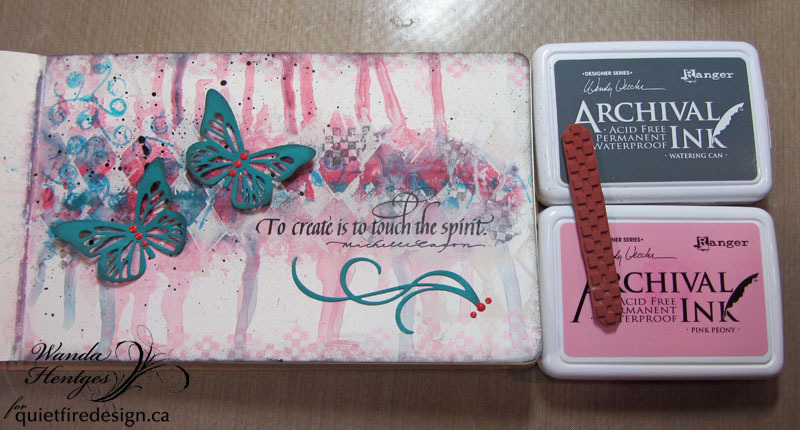 To stamp the "To Create Is To Touch" quote I used the Tim Holtz Platform. Because I was working in a book I placed the platform near the edge of the counter and hung the book off the side. 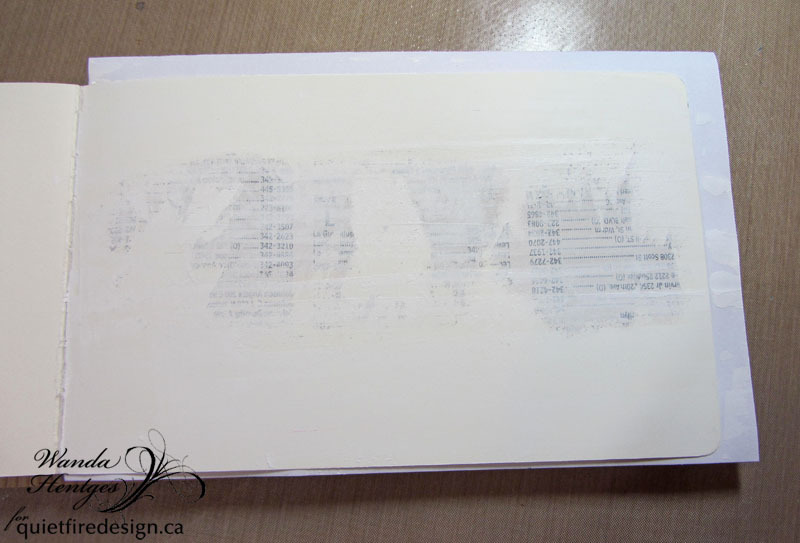 Before stamping in the book I used graph paper to make sure I had the quote lined up straight. Then I removed the graph paper and put in the book page. So at that point there was still some ink left on the stamp from testing on the graph paper and that allowed me to stamp lightly into the book. Next I used Nougat Fresco Finish Paint to lighten just the area in the book that the quote would be stamped so the words would pop and not get lost in the background. 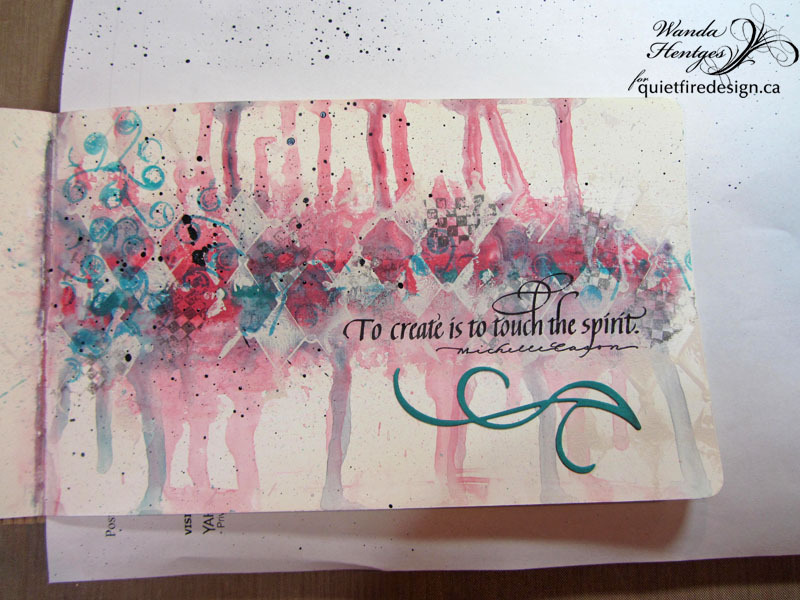 Once the paint was dry, I stamped the quote multiple times to get a nice, dark image. I was working on adding the embellishments - Butterfly from the set Butterfly Flourish and the flourish from the set Calligraphic Elements 3. I die cut the pieces from white cardstock, painted them with Jade Fresco Finish Paint, dried them and added shading with Archival Ink Watering Can. 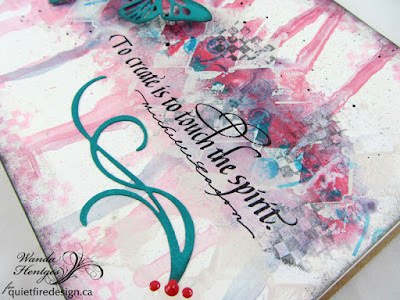 I glued the flourish on the page and then decided I wanted some splattering. I tore a scrap of paper to cover the quote and flourish area, splattered watery black paint on the page, dried the page, and then glued the butterflies on just in the body area so the wings could bend up. 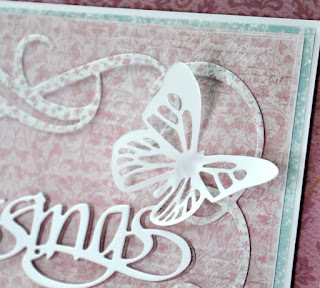 Enamel Accents, Carnation Red (Ranger, Wendy Vecchi) was used to add dots on the butterflies and by the flourish. I was going to call it done but I just had to do more to the edges because it just didn't seem done. I stamped the Checkerboard image along the top and bottom with Archival Ink Pink Peony and then sponged Watering can on all the edges. This page was a lot of fun. I'm getting better at just going with the flow instead of over-thinking and talking myself out of the next layer. When I had the two paint colors on I wondered if I had made a mistake but then after stamping the Dotted Harlequin it made everything better!! 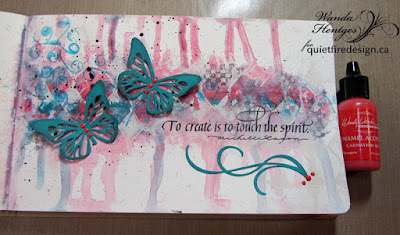 I am quite please with this mixed media page!!! 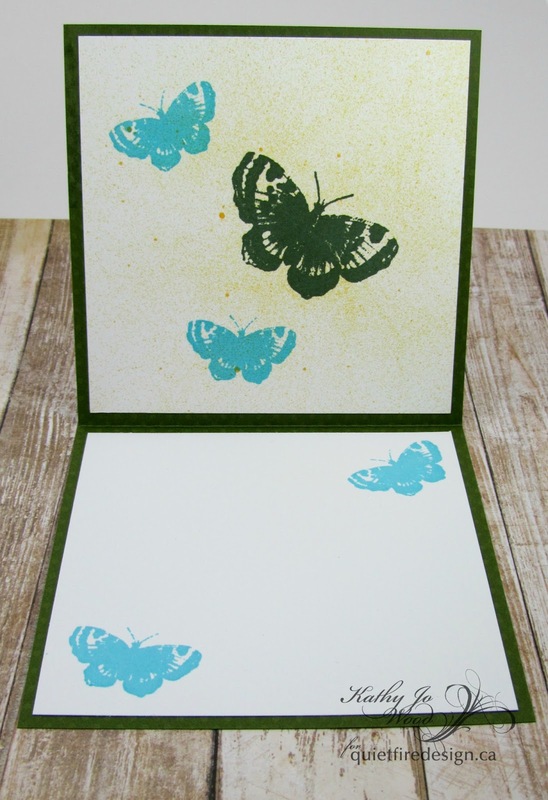 Create a top fold 5" x 5" card using green card stock. Mat a piece of yellow card stock on the card base. Cut a piece of white card stock smaller than the yellow mat (listed in step 1). 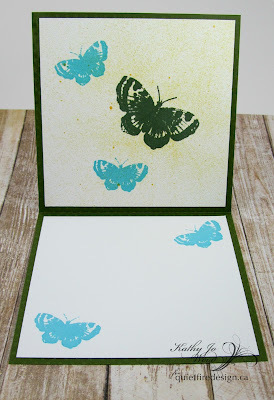 Stamp butterflies using green and blue ink. Spritz with shimmer mist spray. Dry. 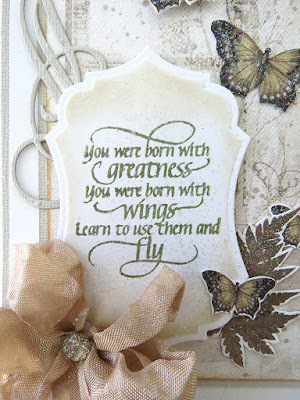 Adhere to card front. 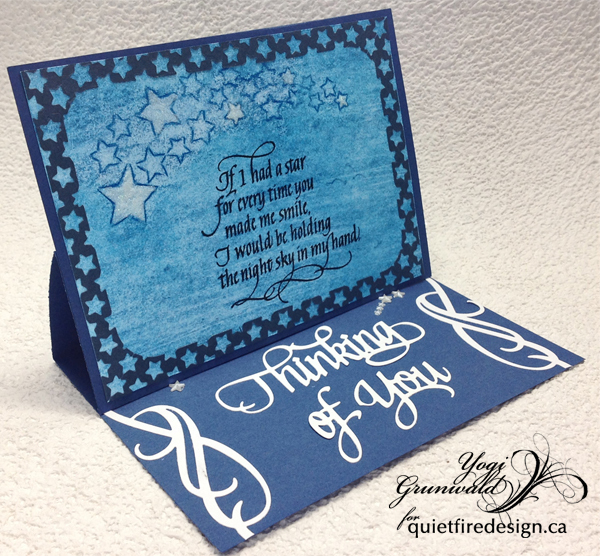 Die cut using Oval Frame die. Flip die cut over. (You will be using the back side of the die cut.) 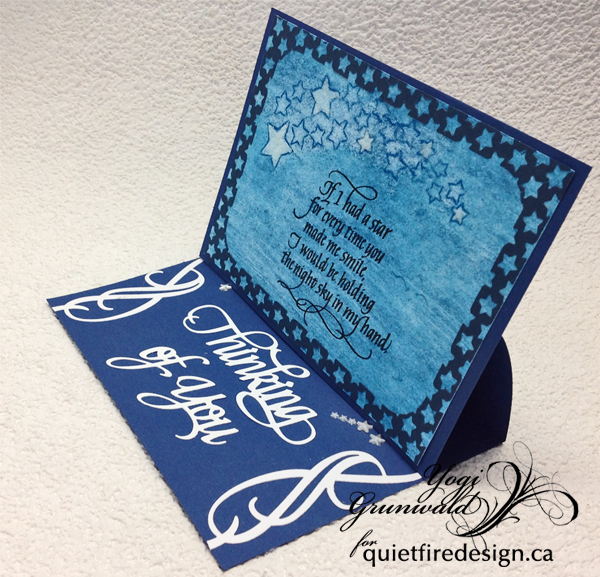 Stamp quote onto center using black archival ink. Apply yellow ink to the flourished end of the oval frame. Apply blue ink to the opposite end of the oval frame. Overlap blue onto a small area of the yellow to create green. 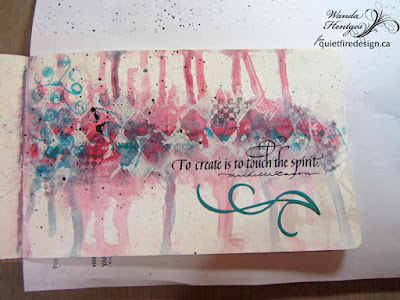 Adhere frame to card using liquid adhesive. 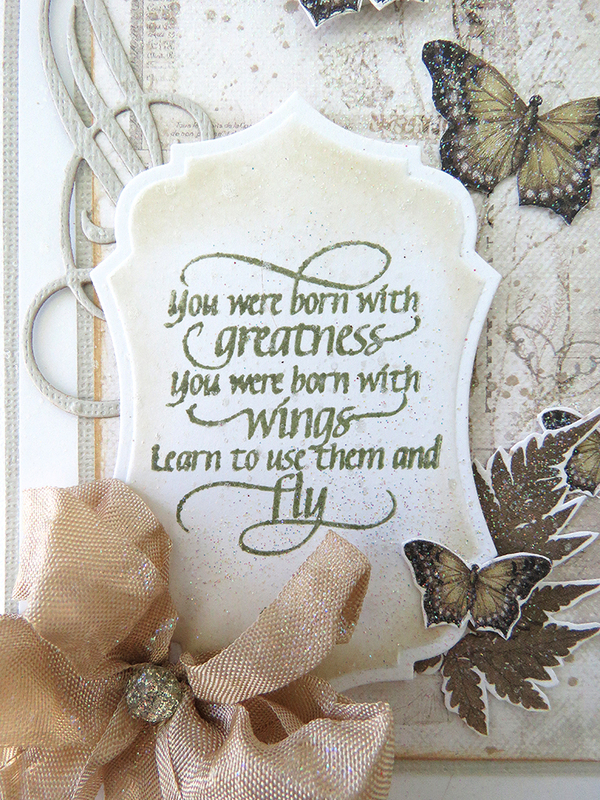 Adhere quote to card front using double sided foam adhesive. 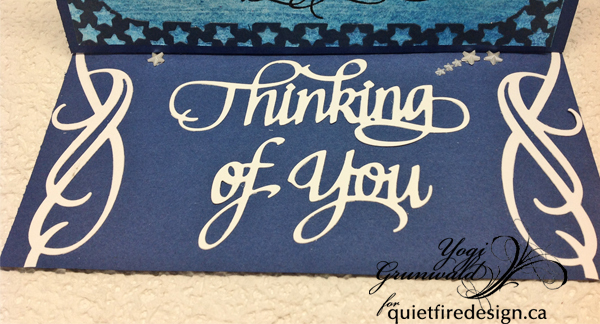 Cut two pieces of white card stock to mat the inside of the card. 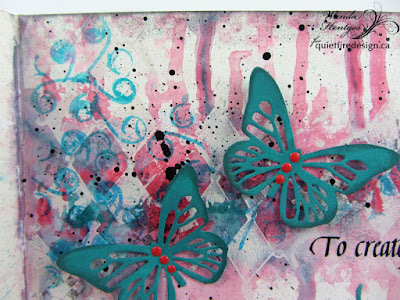 Stamp butterflies and apply shimmer spray as desired. Although I used blue, green and yellow colors for the card, I think it would also look pretty in red, orange and yellow. Yvonne here sharing a CAS Valentine's Day card. 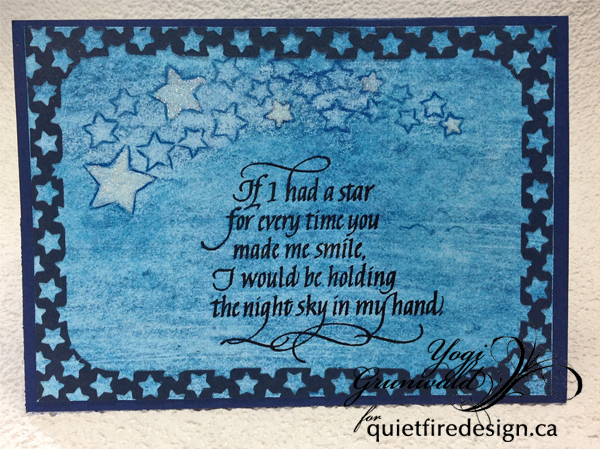 For my card I used the Quietfire Design stampset "Love Fill'er Up". These gorgeous letters are perfect for doodling or (like me) coloring. 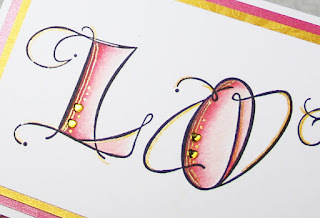 Each letter is colored using pencils and then I drew some gold accents with a pen. 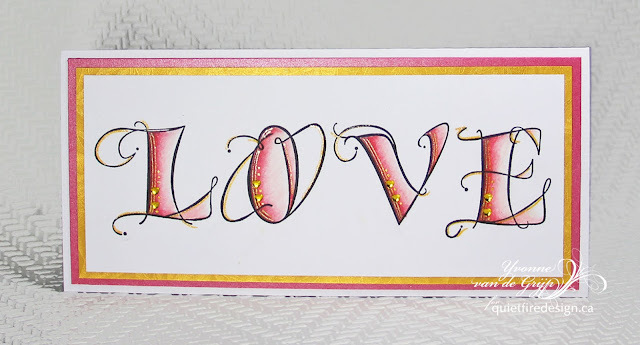 Sometimes less is more so only a few rhinestone hearts were added to finish the card. I hope you like the card and wish you a Happy Valentine's Day tomorrow! It's Teresa here today! 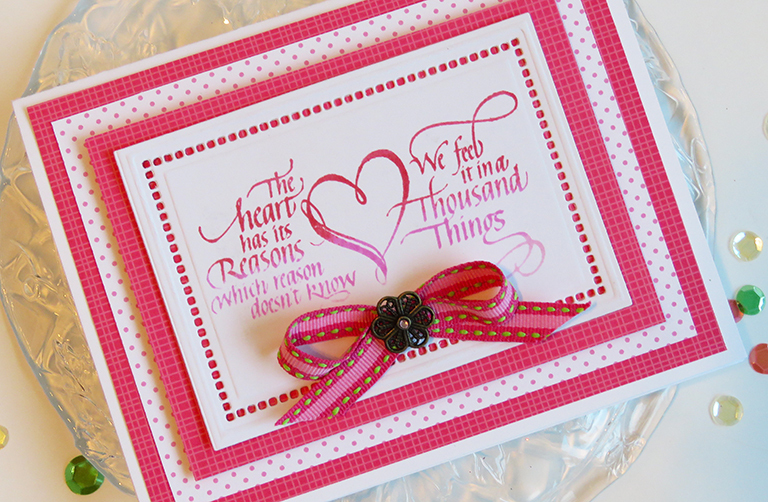 It's almost Valentines day so I'm sharing a quick card using one of my favorite stamps called "The heart has its reasons". 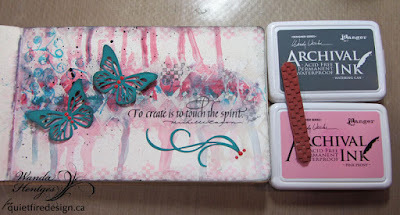 Everything comes from inspiration so today mine started with this gorgeous stamp and a new stamp pad i got that has variegated colors of pink in the pad. So I stamped sentiment on white paper to see how it would come out and then i picked these bright and cheery papers from Doodlebug to coordinate with it. 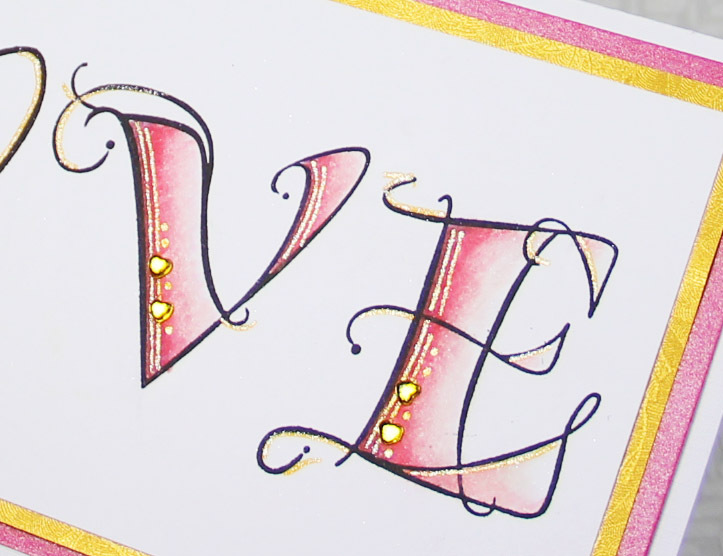 The simple dots don't take away from the stamp and really gives you that pretty pink feel of Valentines and is easy enough to make a bunch to send out or give for the holiday. Here is a closeup so you can see how pretty the ink colors are and i love the heart in the middle. 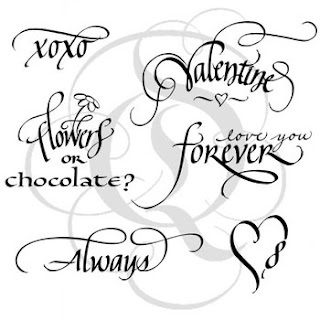 Enjoy your day and have fun creating Valentines for all the special people in your life!! 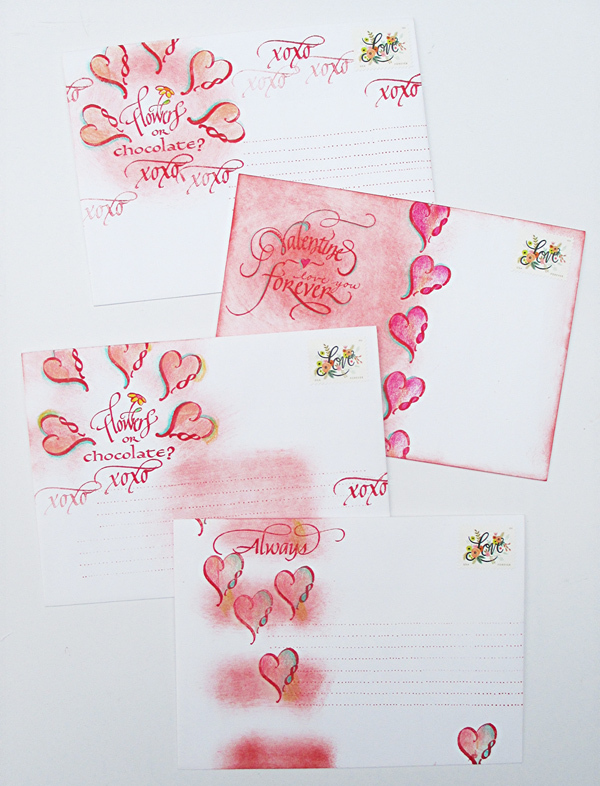 Need some Valentine’s Day cards and envelopes in a hurry? These are easy and lightning-fast! 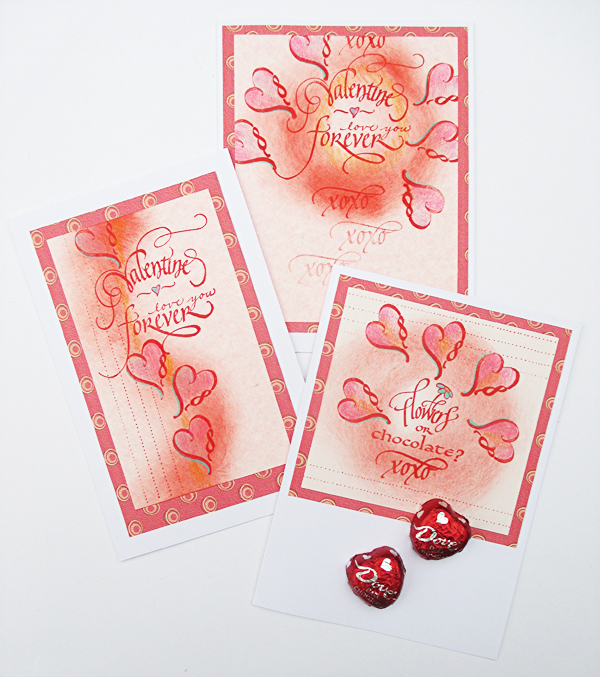 Simply STAMP with red ink, SMUDGE with some of the same ink, and COLOR with your favorite pencils. 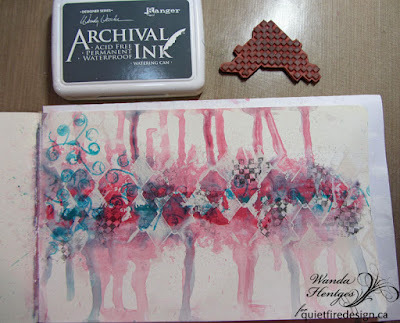 Optional: If you enjoy doodling or have a dot-pattern stamp, add dotted lines. 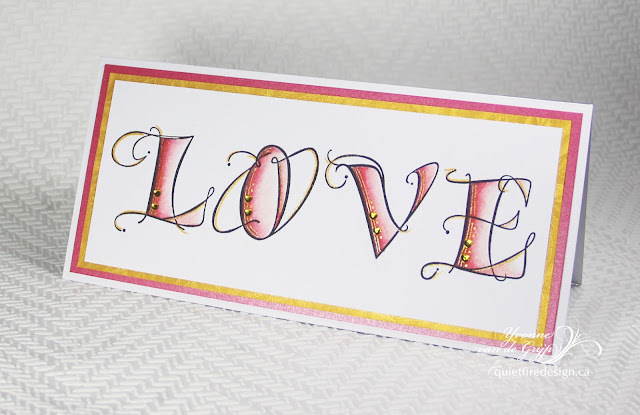 Add a patterned cardstock border, layer onto a white side-fold card base. Done!